The origins of the phone in your pocket are probably older than you think. Running Android or an iPhone? Well, that operating system is based on Unix which was created in the early 1970s. Running Windows Phone? That is based on Windows NT from the early 1990s, which in turn was largely inspired by another 1970s operating system, VMS. Have a new BlackBerry? Well, that's based on QNX from 1980s. But one thing that links almost all modern smartphones is the processor - almost every one sold runs on some sort of core licensed from the British company ARM. But the story of ARM begins with something familiar to anyone who grew up in Britain during the 1980s - the BBC Micro. This 8-bit microcomputer was developed in conjunction with the BBC by Acorn. At first glance it seems to have little in common with those tiny computers we carry in our pockets with just 32Kb of RAM and a 2MHz processor.. after all, even the most basic smartphone has a processor that runs hundreds of times quicker and with 32 times the memory. But there was more to the BBC Micro than that. Conceived one third of a century ago, this humble machine could support a second processor, had a built in analogue to digital converter, optional networking and speech synthesis, a whole host of interface ports, possibly the best audio of any machine at the time and high-resolution graphics. 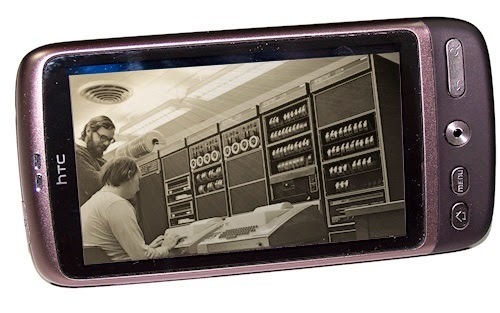 With the optional Teletext adapter the BBC could download news, information and even programs over a TV signal, and with a Prestel adapter it could access information over the phone line. 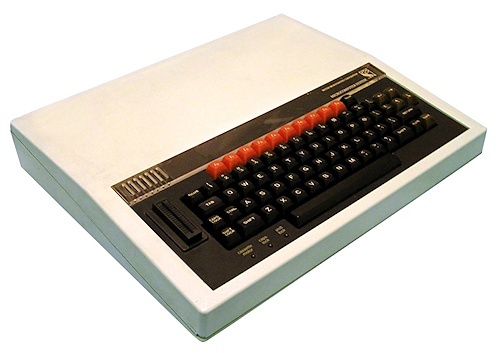 The BBC Micro was designed from the outset to communicate with other devices and to be flexible and expandable. But the key thing about the BBC Micro was that it was fast. Really fast. Some of this was down to the highly optimised version of BASIC that programs could use, but mostly it was down to the processor itself. Although clocked at a modest 2MHz, the 6502 processor was significantly speedier than the rival Z80, due mostly to the simple design of the onboard logic which meant that it was relatively primitive but also very quick. 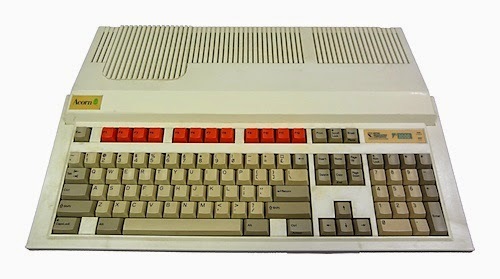 In turn, the simplicity and speed of the 6502 inspired Acorn to develop their own processor, the 32-bit ARM which appeared in Acorn's Archimedes computers in the late 1980s. The Archimedes range used and evolved many of the same features pioneered in the BBC, but the processor was a huge leap forward. Clocked initially at just 8MHz, the ARM processor's simple internal RISC design was both very fast and relatively cheap to make, which met Acorn's requirements for a home computer. But almost coincidentally, this also made the processor very small and power efficient. ARM eventually spun off from Acorn and began to licence the processor cores to other manufacturers. Although the take-up was initially quite slow, the growth of PDAs and later smartphones from the late 1990s onwards really expanded the use of the ARM processor enormously, and it is now the most commonly used type of CPU in the world. So, next time someone shows you their snazzy new smartphone, instead of just being jealous you can simply point out that it is based on 1970s and 1980s technology instead..